Concussion Rule - The Chip's Challenge Wiki - The Chip's Challenge Database that anyone can edit! The Concussion Rule is a special rule of monsters which run into traps when they are faced towards an illegal direction. Whenever affected monsters, which are the fireball, glider, pink ball and walker, are released from a trap, Chip's Challenge first checks if the move out of the trap is legal before allowing the monster out. Since the game checks whether the move is legal before the wall takes effect on the monster, a pink ball would be stuck instead of being released and promptly bouncing back. If, instead of a fixed wall, the space ahead of the monster is a Chip-removable tile, then removing the tile will allow the monster to continue as normal. If the brown button has already been hit, the monster will move when the square is opened, killing Chip unless he boosts off the square. The blob is not affected for the same reason it is not affected by the C/B Glitch; its movement is not initialized, so it gets around the initial attempt to move into the blocked square that hangs up Chip's Challenge's attempt to release other monsters. The Controller and Boss Glitch has primary jurisdiction when an affected monster is released, so they can avoid the rule as well. A tank can be reversed mechanically, such that it avoids being stuck. The reason for this is because the tank does not have to try the blocked space in front of it to reverse; in contrast, Chip's Challenge must determine that a pink ball's next intended move is blocked before it can command the ball to reverse. Here, the fireball cloned from the clone machine will stop Chip from continuing past the brown button. Chip must hide at [1, 5] until it passes, and then can freely move past to the force floor, as neither the fireball's press nor Chip's second press will release the pink ball to clone further fireballs. If there were a force floor at [5, 3], the ball would be allowed to continue cloning fireballs and Nightmare would be cooked. While this fix would hurt this level, it is a common way to prevent unintentional concussions from cooking a level. In Chip's Challenge 2, the Concussion Rule does not exist; open traps are acting floor. As a consequence, the Steam version of Nightmare required an edit in order to remain solvable. 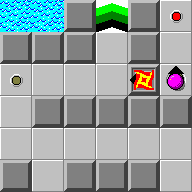 In the modified version, a water tile was added so that the pink ball drowns after cloning only one fireball.